It’s been three years since I last spoke to Superwoman, as she’s most popularly known…an exceptionally long time in the world of digital stardom. Since then, the Canadian YouTube whizz has had a mega world tour, a make-up deal, spots on Forbes lists, acting roles and music ventures, all while writing her book. Taking a cue from Bawse, the signature red lipstick that she launched with cosmetics giant Smashbox, her book — How to be a Bawse: A Guide to Conquering Life — quickly claimed the number one position on The New York Times’ business bestseller list. And, over and above being appointed as a Global Goodwill Ambassador by UNICEF, her first major acting role has just been confirmed. She’ll appear in an HBO adaptation of Ray Bradbury’s classic dystopian novel, Fahrenheit 451. While prepping for my tête-à-tête with her in Mumbai, during her second world tour, I wonder how much all this, along with her more-than 11 million subscribers, has changed her from the zany girl who once answered my question about her future by quipping, “Hopefully I won’t be homeless.” But the moment she walks in, unpretentious as ever, greeting every single person in sight and making self-deprecating jokes, I recognise the same woman — with a stronger aura. This here then is Superwoman 2.0…. “Let’s do this, I’m pumped!” she claps, ready for the first dialogue of the day, which is with Verve. 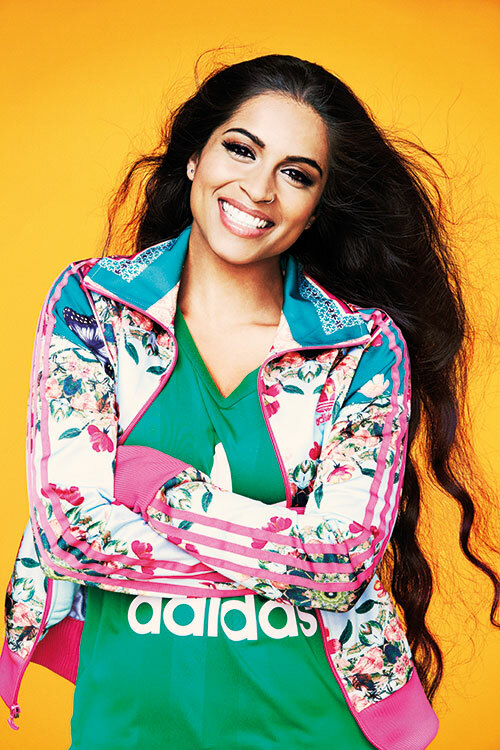 Bantering with the photographer and stylists, having already learnt everyone’s names, she curses her waist-length hair in true Lilly Singh fashion and recalls our last chat. “Damn, it’s been a while, huh? This is now my fifth time here.” She gets visibly emotive while relaying her arrival at the airport; exiting to a swarm of fans with signs that read ‘Welcome home’. “That has never happened before…. I wasn’t born here, but people are still accepting me as one of them.” Support is something she values a great deal, mainly because she had to work hard for it. Her family understandably took a while to embrace her decision not to pursue her masters in counselling psychology and instead make funny videos for a living. Add that to backlash from the South Asian community who felt that she “should be quiet and not speak so much and be very obedient” and you have a delicate path to navigate. Because of this, the entrepreneur considers one of her greatest moments to be the time she visited her grandfather in Punjab after her first world tour. He announced that out of every single person in the family, male or female, she had brought the most pride to their name. “For him to say that to a girl, despite having an old-school mindset, that was a great accomplishment for me,” she reminisces. But don’t for a second think that Singh is being ungrateful. One of the most appreciative public personalities around, she stretches herself thin to make everyone happy and, at the same time, make a difference. One of my favourite things that she’s spearheaded is Girl Love — a social media campaign aimed at ending the cycle of girl-on-girl hate. In addition to awareness videos, collaborations with other empowering women and motivating Singh’s younger audience to support each other, Girl Love sells a bracelet which helps girls in Kenya to go to school. “There are a lot of issues that negatively impact women. It has just been way too long and I want to do my part,” she explains.